Peterborough Town's Joe Dawborn celebrates a wicket. Last night’s (July 2) penalty shoot out at the Euros appeared to last longer than Peterborough Town’s Northants Premier Division match at Wellingborough yesterday. Town’s ability to demolish the weaker teams in the competition has not been in doubt this summer, so no real surprise that the worst of them all were blown away in under 30 overs and in less than three hours. Jamie Smith in action for Peterborough Town. Wellingborough were inserted - quite possibly to groans from those Town players who don’t open the batting or bowling - and were shot out for just 39 in 20 overs and five balls delivered by pace aces Joe Dawborn and Jamie Smith. The hosts joined Stony Stratford (48) and Rushton (54) as teams to have despatched with indecent haste by the city side this season. Dawborn, whose run-up has not been dis-similar to Zaza’s at times, gorged on easy meat to return figures of 7-16 from one ball shy of 11 overs, while Smith was no less hostile in claiming figures of 3-21 in 10 overs. That’s 55 wickets between them this season with Dawborn’s 33 shooting him to his regular place at the top of the wicket-taking charts - Smith is a creditable seventh with 22. Wellingborough’s total was almost even worse as Town dropped a couple of catches and delivered seven wides. Six home batsmen failed to trouble the scorers. 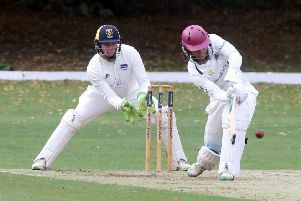 Town promoted Lewis Bruce to open and he scored a fluent 23 (three fours, one six) before he became the only wicket to fall as Town raced hom in seven overs and one ball. Elsewhere there was a crucial two-wicket win for leaders Old Northamptonians over second-placed Finedon. At the half-way stage, ONs are 27 points clear at the top and 29 points ahead of third-placed Town. Bowling: J. Dawborn 10.5-3-16-7; J. Smith 10-3-21-3. Bowling: K. Tapp 4.1-0-22-1; A. King 3-0-18-0. Oundle are becoming the draw specialists of the top flight. They closed on 138-8 in pursuit of Broxworth’s 225-5 to register a fourth draw of the season. Ounel are next-to-bottom, but a healthy 25 points clear of Wellingborough. Jack Bolsover (4-61 & 36) was the player to emerge with most credit yesterday. Brixworth 225-5 (T. Worthington 71, M. Bell 63, W. Thomas 59no, J. Bolsover 4-61). Oundle 138-8 (J. Bolsover 36, P. Foster 26).